Last weekend, I overheard a couple of my teenagers talking about the upcoming holidays. Surprisingly enough, they weren’t going on and on about the newest high-tech gifts they can’t wait to receive, the excitement they have when they climb up on the roof to hang Christmas lights or even the anticipation of being out of school for Christmas break. What was the topic of their conversation? Food. 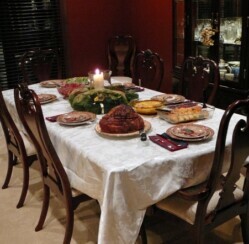 While we all know that few things are more important than food when it comes to teenaged boys, I have to say that I was quite impressed, (and a little bit flattered) when they carried on so enthusiastically about the abundance and variety of food that adorns our dinner table on Christmas day. I always try to change things up a bit when it comes to Christmas dinner. After all, with all the Christmas dinners that we attend with family and friends, even ham and potatoes can get a little bit redundant. If you are thinking about adding some variety to your Christmas dinner, never fear; I’ve put together a list of some of the best Christmas dinner ideas imaginable. Coffee Crusted Beef Tenderloin and Roasted Garlic Potatoes: A ground coffee, brown sugar, paprika, garlic powder and salt and pepper rub makes this tenderloin completely divine. 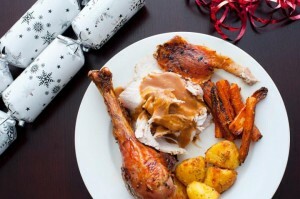 Add a side of roasted garlic new potatoes, and you’ve got a mouthwatering Christmas dinner that is certain to please. Apple-Cider Turkey and Potato Salad: A sweet and refreshing take on an old favorite, this apple-cider turkey will have them begging for more. When combined with classic potato salad, guests will appreciate this lighter version of the typical Christmas dinner. Brown-Sugar Glazed Ham and Garlic Asiago Salad: This holiday ham will definitely stand out from the crowd this Christmas, especially when accompanied by a light and tastey garlic Asiago salad. Barbeque Turkey Breast and Wild Rice Stuffing: Something different with the bird, barbeque rubbed turkey breast and wild rice stuffing is a new twist for Christmas dinner. Citrus Tapenade Game Hens and Twice Baked Potatoes: Although I wouldn’t recommend this option if you are feeding an army this Christmas, as it can become a bit expensive in a hurry, this is a wonderful choice for a cozy family feast. Beef Rib Roast and Roasted Vegetables: The savory mix of herbs, spices, and of course bacon make this one of the most scrumptious Christmas dinner ideas yet. Veggies are roasted right along with the beef to add flavor and zest your taste buds will adore. 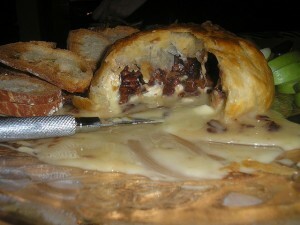 Beef in Puff Pastry and Sugar Snap Peas: A little something different for the holidays, this Boeuf en Croute with sugar snap peas dinner will have guests begging for the recipe. Cherry Stuffed Ham and Scalloped Potatoes: Move aside cranberries- the sweet tart flavor of this cherry stuffed ham is delightfully fruity. Serve with scalloped potatoes and watch it disappear. Pecan Parmesan Pork and Baked Sweet Potatoes: The port sauce makes this tenderloin shine. Add a side of baked sweet potatoes for a sweet but healthy touch. Holiday Roast Goose and Lemony Green Beans: Roasted goose topped with a syrupy honey-ginger glaze goes wonderfully with lemony green beans for a truly festive holiday feast. What’s for Christmas dinner at your house this year?